Participants of the 2018 Beahrs ELP. The application deadline for the Beahrs Environmental Leadership Program (Beahrs ELP) has been extended to January 25, 2019. The Beahrs ELP is also excited to announce the launch of a new scholarship program for American and Canadian applicants. Though the scholarship is available only for applicants in the United States and Canada, all applicants are encouraged to submit application materials until the new January 25, 2019 deadline. To apply, please visit the Beahrs ELP website. The Beahrs ELP provides state-of-the-art training in environmental and natural resource science, policy, and management, and leadership to mid-career professionals. Currently in its 19th year, this intensive program will be held from July 12 to August 2, 2019. 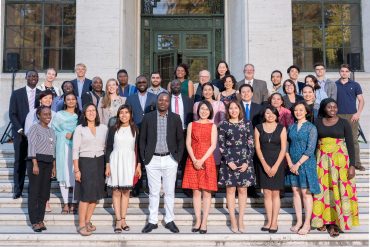 Upon completion of the program, participants receive a UC Berkeley certificate in Sustainable Environmental Management, as well as lifetime membership in the alumni network of 670 environmental practitioners from over 110 countries.